This amazing substance appeared in Philip Frances Nowlan’s short story, Armageddon: 2419 AD in 1928. The closest film I could think of to use this substance is 1979’s Buck Rogers. So many unexplained power sources from the Draconian Empire, not to mention on Earth. The movie was the prelude to the series and starred Gil Gerard, Erin Gray, Felix Silla, Mel Blanc, and Pamela Hensley. Rachna Chhabria at Rachna's Scriptorium must have access to this material. She’s come in under the radar and accomplished so much with her writing and her knowledge. 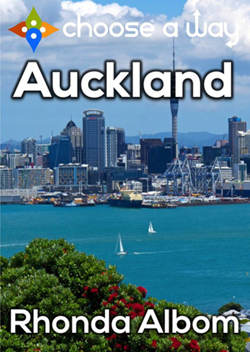 It will amaze you! An early use of the notion of matter transmission. Telepathy and telekinesis appeared long before teleportation. Vibra-transmitter/teleportation was featured in Frank K. Kelly’s short story, Into the Meteorite Orbit in 1933. A movie that featured all of that is X-Men: Days of Future Past. Wolverine is teleported into the past to save the future. Starring Hugh Jackman, James McAvoy, Michael Fassbender, Jennifer Lawrence, Halle Berry, and Peter Dinklage. J E Oneil at Still Writing will teleport you back to a time when language was simpler – or not! Either way, you will learn a thing or two, and be amused in the process. This appears in what it considered the first science fiction book, Somnium (The Dream) by Johannes Keplar in 1634. Written in 1608 in Latin. A prime example of this is 2013’s Gravity. The characters spent the entire film in zero gravity and weightlessness. It starred Sandra Bullock, George Clooney, and Ed Harris. Beverly Stowe McClure at The Story of a Writer makes this author thing look easy. She floats through it all with ease with numerous books and awards. But it’s her grace and attitude that makes it all possible. A device that projected soft x-rays into small planetoids to determine their composition. First appearing in Diamond Planetoid by Gordon A. Giles in 1937. There are probably others, but the first movie that came to mind was 1983’s Star Trek III: The Search for Spock. This is something that was probably employed on the planet where Spock’s body was laid to rest in Star Trek II: The Wrath of Kahn, as the planet was basically created by the Genesis Project. Starring the usual suspects – William Shatner, Leonard Nimoy, DeForest Kelley, James Doohan, Walter Koenig, George Takei, and Nichelle Nichols. Liz A. at Laws of Gravity probably wishes she had an X-Bean Projector. Then maybe she could figure out some of her crazy students. For an adventure in puberty and more, jump on for the ride. Yeast steak was first mentioned in a short story by Isaac Asimov in 1950, The Evitable Conflict. It also appeared in several collections, including I, Robot, The Complete Robot, and Robot Visions. The movie that fits the bill – 2013’s Snowpiercer. Those in the lower class system aboard the Snowpiercer are fed a synthetic, Jell-O like substance grown on the train. This low-budget film was surprisingly original and starred Chris Evans, Ed Harris, John Hurt, Tilda Swinton, and Kang-ho Song. Robyn Alana Engel at Life by Chocolate isn’t about to grow her own yeast steak. Unless it’s made of chocolate. Or men. Or maybe chocolate men? Either way, she’ll satisfy you! We see the Zero-ray first in a short story by Clark Ashton Smith in 1931 – An Adventure in Futurity. One movie fits the description perfectly - Despicable Me. Gru used his Freeze-ray gun to get ahead of the line at the coffee shop and to silence the Evil Vector. Released in 2010, it starred the voice talents of Steve Carell, Jason Segel, Russell Brand, and Julie Andrews. Deb at Just Keepin' It Real, Folks! will zap you every time! No topic is sacred. No subject too weird to tackle. She’ll freeze you every time, right down to your funny bone. We’re almost at the end! Are you a Challenge survivor? Then tell the world. 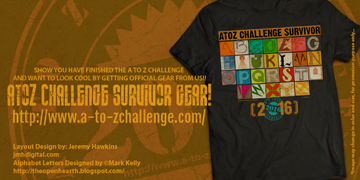 Co-host Jeremy Hawkins has created a t-shirt and a mug so you can proudly tell everyone that you survived the 2016 A to Z Challenge! Think it’s about time someone invented teleportation? Want to ride on the Vomit Comet so you can experience weightlessness? Want to snack on some yeast steak? Fan of the movies featured? 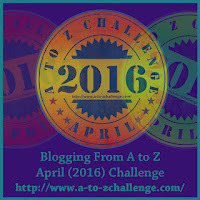 Following those awesome bloggers? 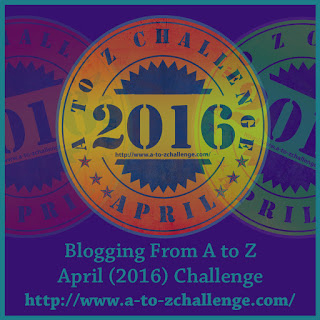 And did you survive the 2016 A to Z Challenge? 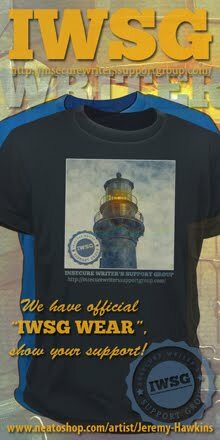 After a busy month and with the IWSG post day next Wednesday, I will be taking next Monday off! 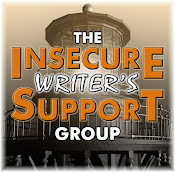 Don’t forget the IWSG’s anthology, Parallels: Felix Was Here, comes out next Tuesday, May 3.